The yoga apparel specialist has taken it on the chin for a while, but signs of a possible recovery are finally emerging. One of the toughest investing questions to answer is whether a high-growth stock that has fallen from grace will get a second wind and start climbing higher again. For yoga-apparel specialist lululemon athletica (NASDAQ:LULU), the fallout from its yoga-pants recall in early 2013 has lasted a long time, and even now, many investors fear that the company will never return to its former glory. But over the past month, lululemon stock has reflected signs of hope among shareholders that the worst might finally be behind the retailer. Let's take a closer look at lululemon to find out why some investors are getting more optimistic about its future prospects and what's next for the long-beleaguered yoga guru. Ordinarily, you'd expect a big move from a stock to come from an earnings report, but lululemon doesn't report its earnings until December. Yet even without a full quarterly update, lululemon athletica inspired some of those who follow the stock closely to believe that the retailer had finally turned the corner. In late October, one Wall Street analyst argued that lululemon had become more efficient with strategies related to its designs and merchandising efforts, and that the company could expect its moves to boost traffic to be successful. Moreover, with a renewed focus on international expansion, lululemon has the ability to capitalize on new sources of growth in areas that don't have as much knowledge of its past product-recall history. 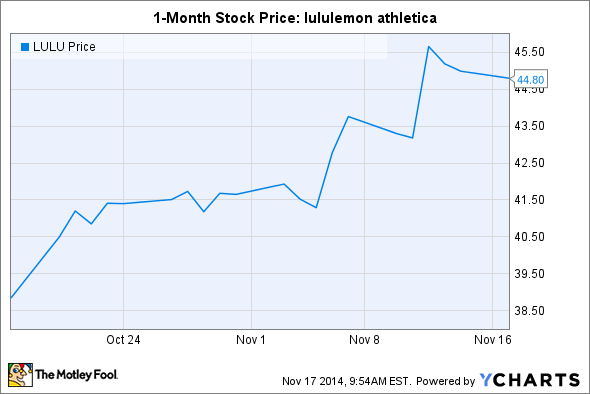 In addition, some of the positive sentiment around the industry in general spread to lululemon. Under Armour (NYSE:UAA) had strong performance during the period as well, beating estimates for earnings and revenue -- but rather than seeing the report as giving Under Armour a competitive advantage, investors seemed to see the results as encouraging for the entire industry, sending shares of lululemon and Nike (NYSE:NKE) higher as well. In particular, some investors hope that favorable comparisons with weaker results over the past year will make lululemon look more attractive as a rebound candidate. It's important to remember that even with a double-digit percentage gain over the past month, lululemon athletica has still lost a huge amount of ground. Share prices are still off by more than a third from where it traded a year ago, and even with its recent gains, the stock has only recovered a small portion of its maximum losses from the summer months. Moreover, not everyone is convinced that lululemon can get back to where it was before the early 2013 recall. Some analysts point to competition not only from athletic specialists like Nike and Under Armour, but also from apparel retailers with a broader focus, such as Victoria's Secret and Gap's Athleta. With same-store sales having plunged recently, lululemon hasn't demonstrated that it can count on all of its once-loyal customers coming back. Finally, lululemon still hasn't managed to address its public relations problems effectively. Founder Chip Wilson has made a mess of the company's relationship with its customers, and the fact that his wife and son have started a retail operation of their own has raised at least some concerns about potential conflicts of interest despite Shannon Wilson's assertions that her husband isn't involved in the day-to-day operations of her Kit and Ace stores. Despite a change in leadership at lululemon, CEO Laurent Potdevin has found progress slow going, and a recent partnership involving a corporate gift to the Dalai Lama Center has some worried that political and religious issues could further distract from a rebound in lululemon's business. 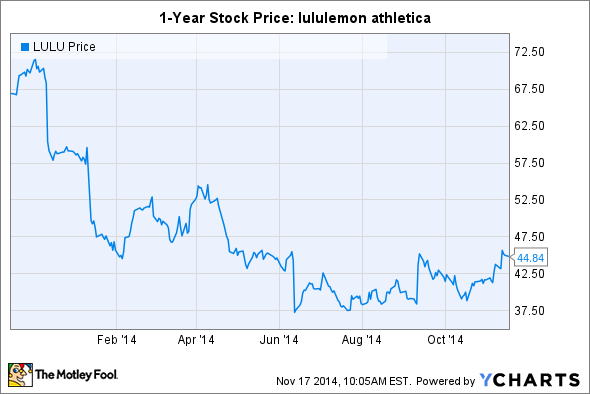 Can lululemon athletica keep heading higher? With the key holiday season coming, lululemon athletica still has a powerful brand and a host of loyal customers. Yet given the sluggish pace of its attempts to restore its reputation, investors should be skeptical about lululemon's ability to turn its fortunes around. Despite lululemon's capacity for growth, the yoga retailer needs its core audience in North America to become avid believers in its products once again, and what happens during the rest of 2014 will go a long way toward telling investors whether lululemon athletica has truly turned the corner.